We needed a new recipe for pork chops. Michael bought a huge pack of thick pork chops at Costco recently and I’ve been collecting pork chop recipes to try. It’s not that pork chops are boring, they just aren’t as exciting as some other proteins. In fact, I didn’t really like pork for most of my life (before I was a vegetarian). This recipe had two components that made me pick it: 1) it was easy as hell and 2) we had all the ingredients and there weren’t that many involved. Perfect. 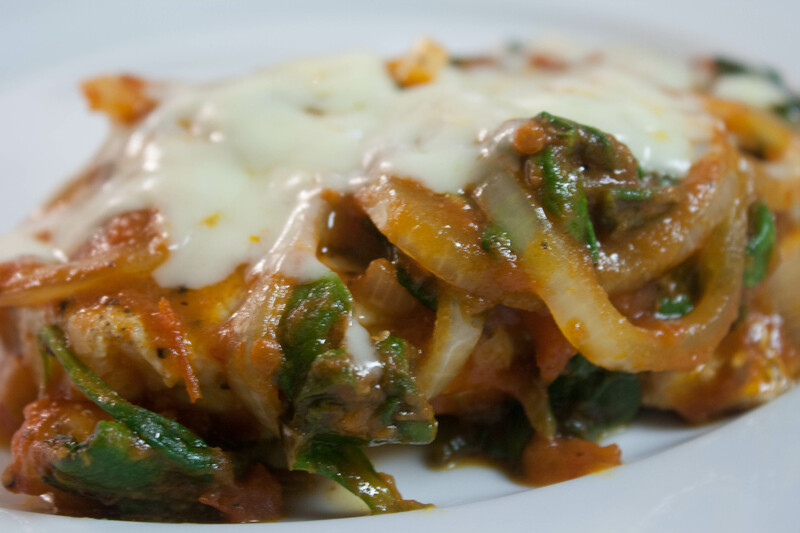 Here is the recipe we tried for dinner recently. Heat 1 tablespoon of the oil in a 12-inch skillet over medium-high heat. Add the pork chops and cook until the chops are well browned on both sides. Remove the pork chops and set them aside. 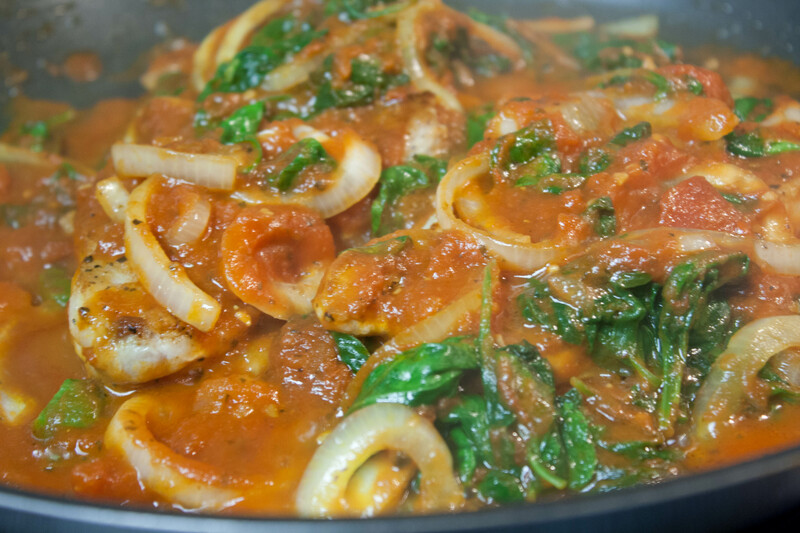 Stir the sauce and spinach into the skillet and heat to a boil. Return the pork chops to the skillet and reduce the heat to low. Cover and cook until the chops are cooked through. Michael cut our pork chops in half lengthwise because they are so damn thick. Cutting them makes them a much more accurate portion size. While he cooked the pork (seasoned with salt and pepper), I made us salads. 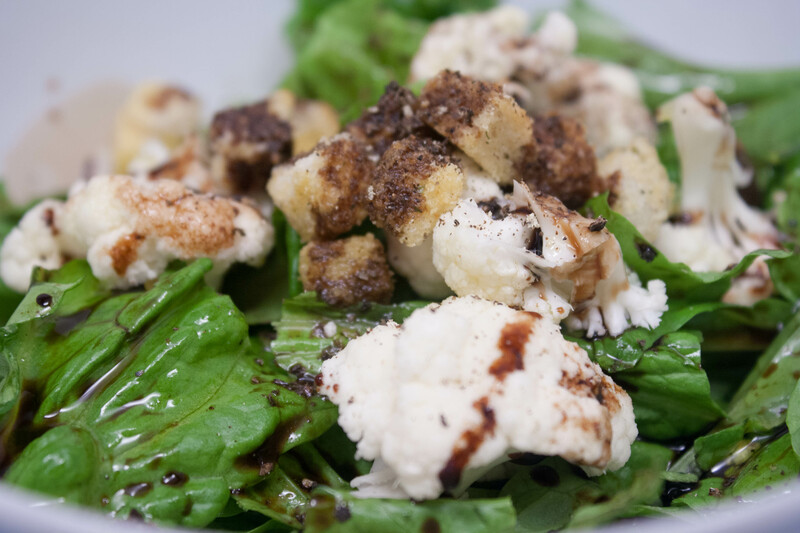 Green leaf lettuce, raw cauliflower, croutons, fresh pepper, olive oil and balsamic. I chopped the onions and shredded the mozzarella cheese for the dinner. 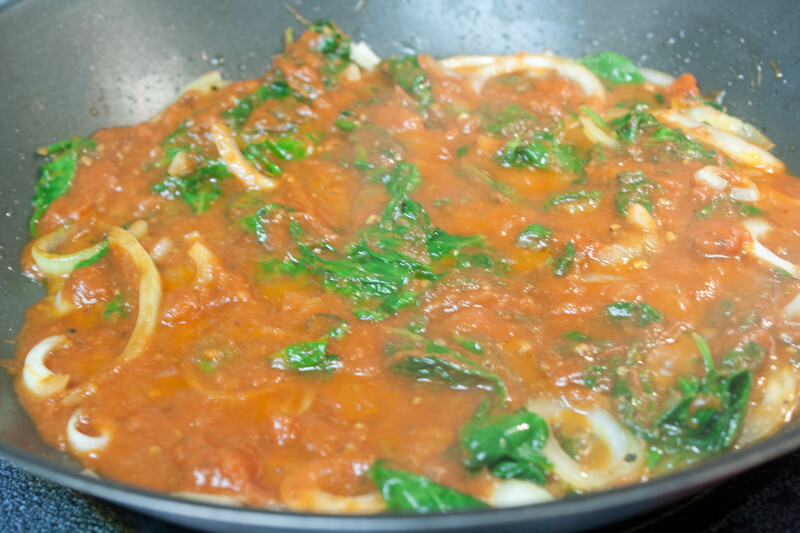 Michael cooked down the fresh spinach (much better than frozen, I think) and let everything simmer together. Michael put the pork chops back into the skillet and let it simmer some more. It smelled heavenly! 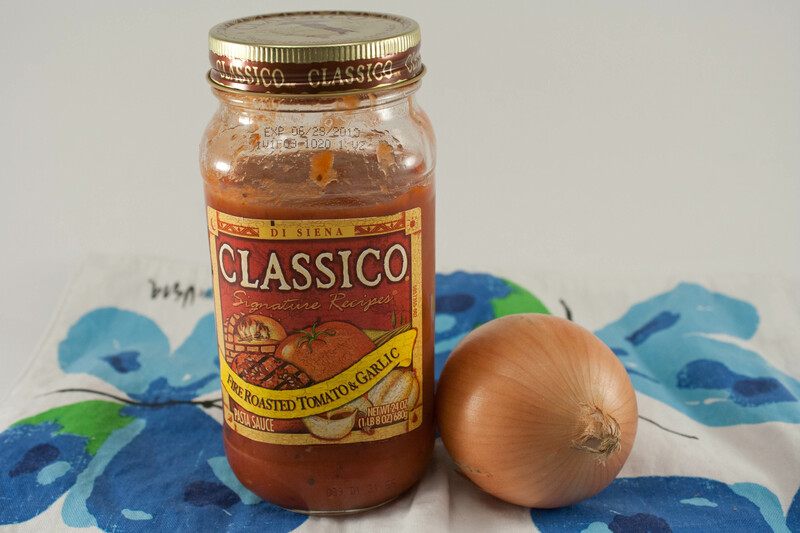 But red sauce and simmering onions usually do. We topped the pork chops with the shredded cheese and let it melt a little bit and then dinner was served! 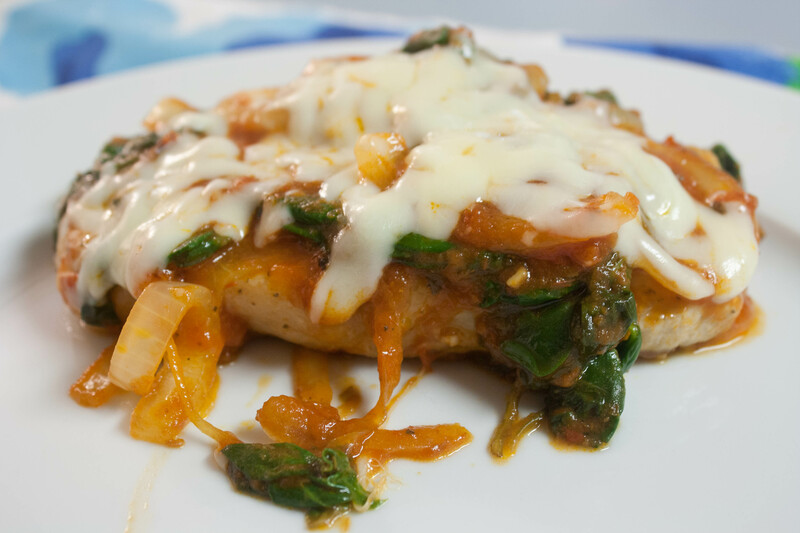 The flavors were really delicious and the dinner was super easy. I think it took a total of 20 minutes and the part that took the most effort was shredding the cheese. This is a good dinner to do on a night when you’re too tired to make a big effort. Michael said it tasted good and he liked it. But with further discussion he said he’d never make it again. His opinion: pork chops have enough flavor and making a dish that covers the flavor seems like a waste. He said that this recipe would be better with eggplant or maybe chicken. I thought chicken would work really well, too. I disagreed with his assessment because I feel like pork chops are kind of bland. I enjoyed it! Smother those chops! QUESTION: Do you like pork? Or do you think it’s bland? I agree with you! I don’t have pork chops a whole lot, but when I do, it’s always the same. So I’m always looking for something new to spice them up! I may just have to try this. We usually buy bone-in chops, but I am going to be switching to boneless as soon as I see some really nice ones. Despite what Michael said, I liked this recipe a lot. I find pork chops boring and this gave it a nice flavor! Try it! We should have pork chops more often…my husband LOVES them because it reminds him of his childhood. Served with applesauce. Personally, I think that is a pretty blah meal. I do like pork tenderloin, that seems more flavourful and versatile. Must say, the recipe here looks darn good!!!! Hope you have a wonderful Wednesday Lisa. I haven’t tried pork chops with applesauce. Sounds interesting! I love pork chops and my husband will not eat them, so I have them when he is working late. I also LOVE pork with apples – you can buy the apple pie filling made with splenda and use it to go over the pork. Pork with mustard sauces and asian flavoring is good also, but chops are great grilled with just salt and pepper for seasoning. I really like to marinate and cook pork loins or tenderloins. YUM YUM! I agree with Michael on pork already having lots of flavor that doesn’t need to be covered. Pork with mustard is good! I’ve done that before and liked it a lot. I love pork and wish we ate it more often. I was lucky enough to find out about once a week one of our local grocery stores puts out what I think are the “unpretty” shops and random large pork loin pieces and tosses them together. Its usually about $1.50 a pound and there’s about 5 pounds per package. I pick one up every chance I get. I think the flavor is almost perfect on its own. I season them with seasoning salt, onion and garlic powder, put a little water in a pan, and shallow boil them until they’re done. Very simple and if you cover the pan, you barely have to watch them at all. My mom has a recipe for breaded pork chops which I keep meaning to try, but it takes several hours and quite a bit (to me) of prep work, though they do taste delicious! I’ve never had breaded pork chops before. It sounds intriguing! That’s great that you were able to find cheap ways to buy meat. We bought the pork chops at Costco in a huge pack. The pork chops are so freakin’ thick that we cut one in half lengthwise and make two normal sized chops out of it. We doubled our money by doing that too. Looks delicious! I’m not usually a huge pork chop fan, but these actually look quite good.